I’ve come to realize since the birth of my son 7 weeks ago that my sewing skills are not as great as I thought they were. In a few of my previous posts, I raved about my excitement to try the covers I sewed for Harrison. Well, none of them fit. Not. A. Single. One. And I have to say that I’m pretty bummed about it. I considered taking out the stitching on the FOE and resewing it, but have had neither the time nor desire to do so (I’ll explain that in a minute). The issue is the leg openings; they’re just too big. When they did finally fit his legs, the waist was too small. Such is life for trial and error. With all of that, I have to be honest and say I wasn’t very happy with the particular FOE I purchased. 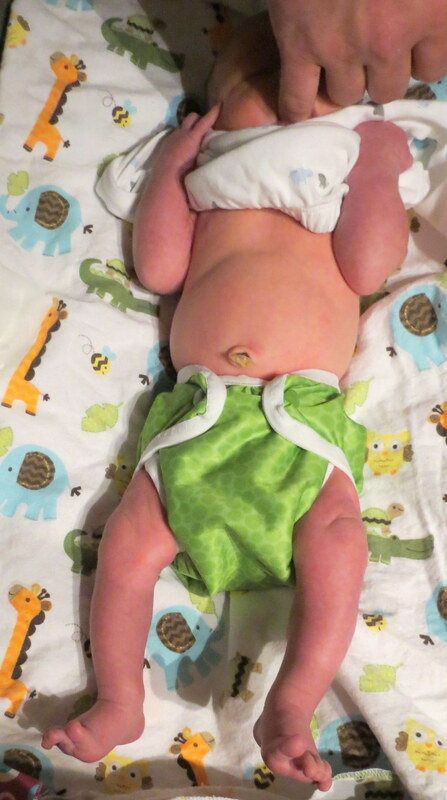 At the time, it seemed great since it came from a reputable diaper sewing website. One of the reasons I use prefolds and covers is I love that covers can be reused as long as there’s no soiling. I typically use 2-3 covers at a time over the course of 2 days to allow time in between for drying. Well, the FOE I purchased completely wicks moisture, rendering it not reusable, even though it is supposedly made of 100% polyester. I think I’m going to email the site and ask if that’s normal to see if I possibly got a bad batch. Since I’m such a newbie to this, I’m clueless. Meanwhile, I’ve since purchased other covers to get me through since I only had 1 other cover–definitely not enough for a newborn. The winged prefolds I made worked pretty well until about 5 weeks. Harrison’s a pretty heavy wetter so they weren’t thirsty enough, even when being changed every 2-3 hours. Next time I make them, I want to try using a different material on the inner layer. We’ll see how far I get with that since time’s been pretty limited. The next project I want to start is a shawl. I purchased a beautiful green colorway of lace yarn a few months back when it was on sale and have been dying to cast on since receiving it. I’d like to be finished (I use that term very, very loosely) with it by the time I go to the beach in September. I’m thinking that’s probably too ambitious of a goal. Well, that’s what I’ve got for today so until next time, much love and many crafty blessings!